Hello everyone! Today I’m going to share some tips for using my embossing folders. 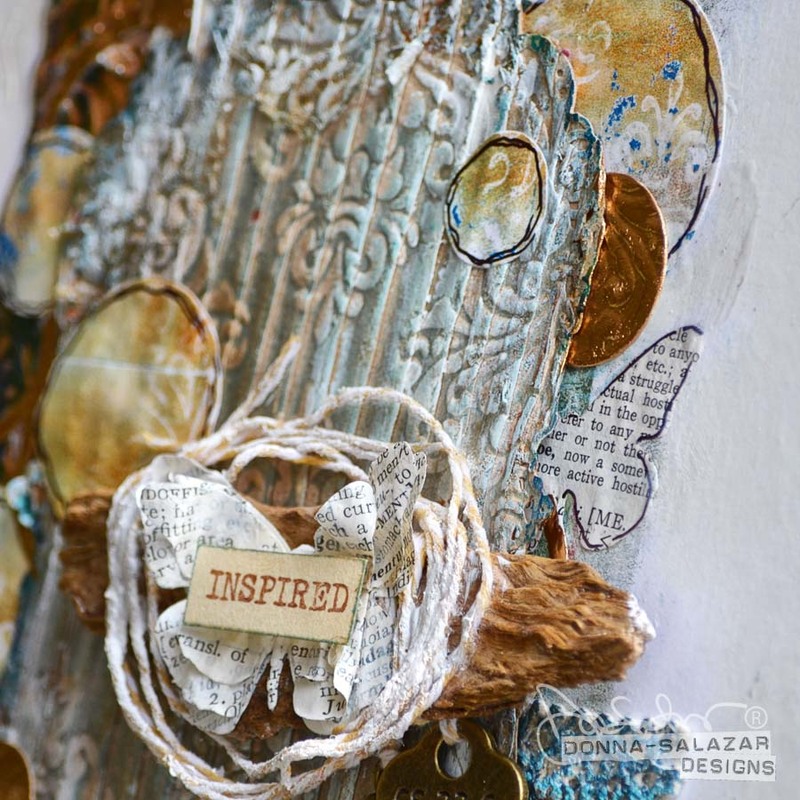 I’ll start with some standard paper crafting tips and eventually share some out of the box ways that I use my embossing folders when creating a mixed media project. These are my 4 embossing folders (Splattered Circles – Bubble Wrap – Medallion – Chicken Wire) and some embossed shipping tags. Now let’s start with some basic techniques for your embossing folders. If you want an embossed or raised image then you want to be able to read the Spellbinders logo on the front. If you want a debossed image then you want the Spellbinders logo on the back. For the images below I flipped the folder open and inked the inside of the front cover with Mix’d Media Inx CHOX which are non-staining. I placed a shipping tag inside the folder and ran it through the Platinum machine. This is what the tag looks like. For this next tag I flipped the folder open and inked the back of the embossing folder. I placed the tag inside and ran it through the Platinum machine. And this is what the tag looks like. And this is what the embossed and debossed tags look like side by side. And this tag was embossed then inked afterward. You can also emboss a dark colored paper or a paper with a different color core then run a nail file over the top to enhance the edges of the embossed design. And here are the basic examples all together. Now this is where we get into my happy place. Because these folders are such high quality and you can emboss pretty much anything when you use them on the Platinum machine you can create some very crazy cool textured elements for mixed media. I die cut a piece of cardboard with Nestabilities Gold Labels Four. I inked the inside of the front of my Medallions embossing folder, placed the cardboard inside and ran it through the Platinum… and this is the beautiful result! The die cut cardboard above had the top layer of paper removed so the corrugation would show more but you don’t have to do that. You can get an amazing image on a regular thick piece of cardboard (the piece on the right was taken off of a shipping box). Also in the picture is a piece of copper. I got a roll of this several years ago while out junking. The copper was actually pretty wrinkled but when I put it in the embossing folder and sent it through the Platinum it smoothed it right out and created a gorgeous textured piece of copper!!! I keep 2 of each of my embossing folders on my work table. The first is kept clean-ish for paper crafting. I may ink it but I wipe it clean when I’m done. The second is full of paint because I use them on my Gel Press plates for making the most AMAZING textures for my monoprints. The photos below are an example of how I use them. 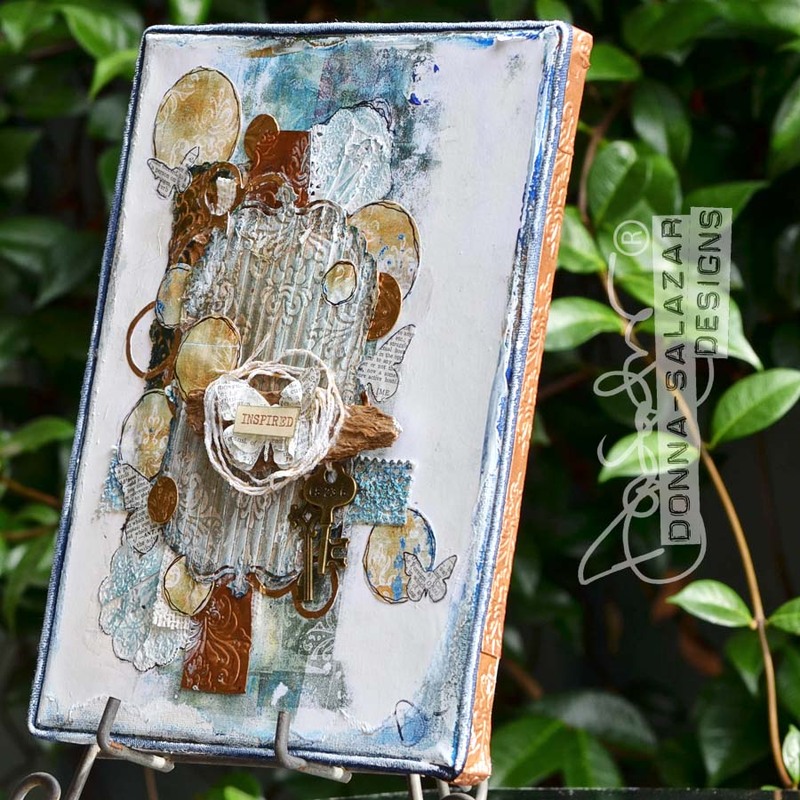 I roll a bit of paint onto my Gel Press plate, press my embossing folders into the paint and I lift and press them a few times using them like ginormous stamps. And this is the print that I lifted off the plate. This could be used as is but for me, personally, I would add one or two more layers with different colors and patterns. 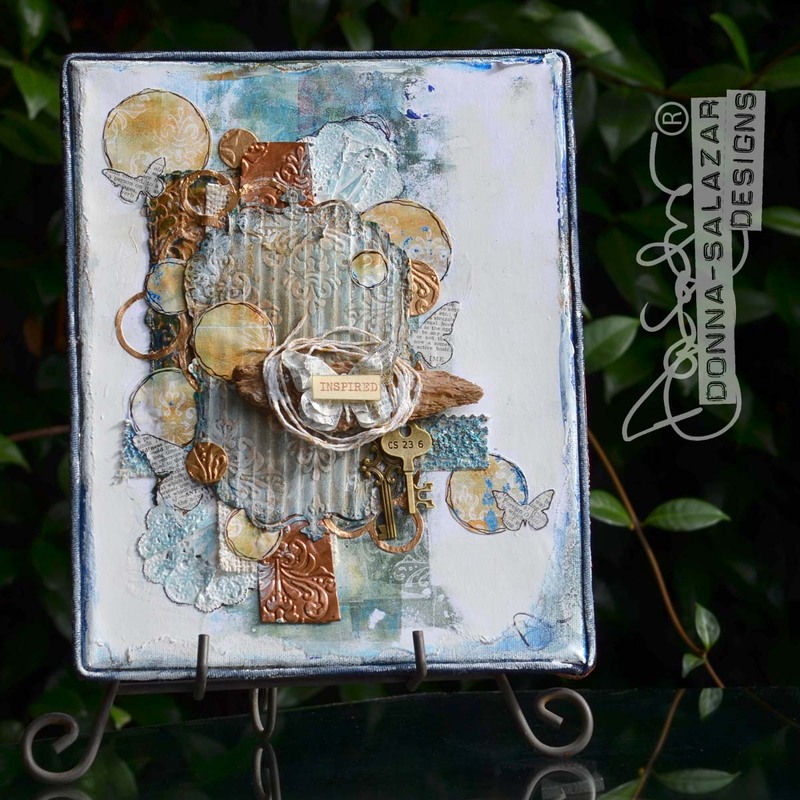 This is how I used one of my monoprints to create a mixed media canvas. I adhered the print onto an 8×10 canvas using Girlie Grunge Art Medium. I used an 8.5×11 paper so I tore the excess paper to create a girlie grunge edge. I grunged up the edges of the embossed elements with paint then layered them onto the canvas adding in some Lace Ribbon and paper doilies too (but I didn’t adhere the embossed cardboard). I die cut some of the other prints that I had made with my Cascading Circles die and placed the pieces onto the canvas. I adhered all the pieces on the background with Girlie Grunge Art Medium. I added some butterflies die cut with my Cascading Butterflies and adhered the embossed cardboard with Dodz XL Adhesive Dots. Then denim piping with Premium Double Sided Tape 1/2″. Then I cut some of the embossed copper into 1/2 inch strips and adhered them around the edges of the canvas with Extreme Double Sided Tape 1/2″. I tied a couple metal keys to a piece of driftwood with Girlie Grunge Twine. I trimmed the ends of the twine, added some Dodz XL Adhesive Dots, heated them with a heat gun (to make them into hot glue dots) and adhered it to the canvas. 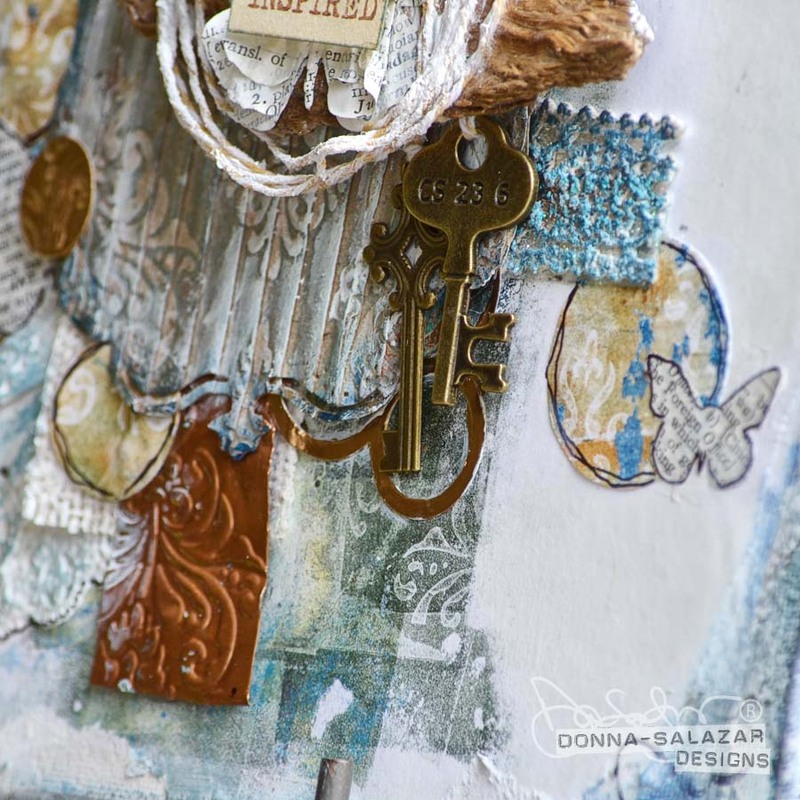 I added layered butterflies die cut with my Cascading Butterflies, a stamped word from my Journal Words stamp set, and stiffened twine using Girlie Grunge Twine and Girlie Grunge Art Medium. I had doodled on the Cascading Circles frame but didn’t like it so I painted over it with Testor’s Gold Enamel Paint Marker and added some die cut and embossed circles that I also painted with the same marker. This is a close up of some of the embossed elements. I hope you enjoyed my tutorial and that you will try to use your embossing folders in new and unusual ways! I’d love so see photos of any projects that use my embossing folders (or any of my Spellbinders products) so if you post them on social media please remember to tag me. I always like and comment on tagged photos. 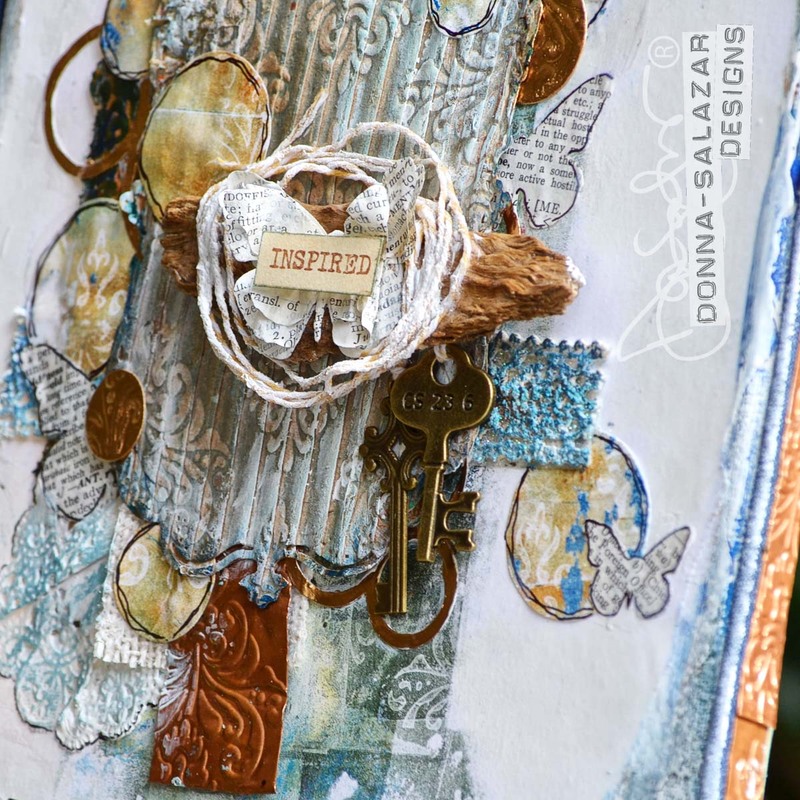 Donna Salazar is a wife, a mom, a grandma (to the cutest little boy that has ever walked the planet), an artist, a designer, an instructor and a self proclaimed overgrown kid. 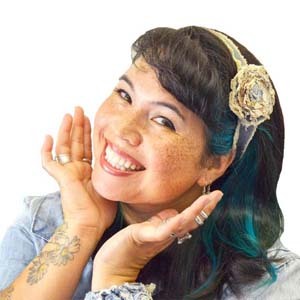 She owns her own Design company called Donna Salazar Designs, LLC. 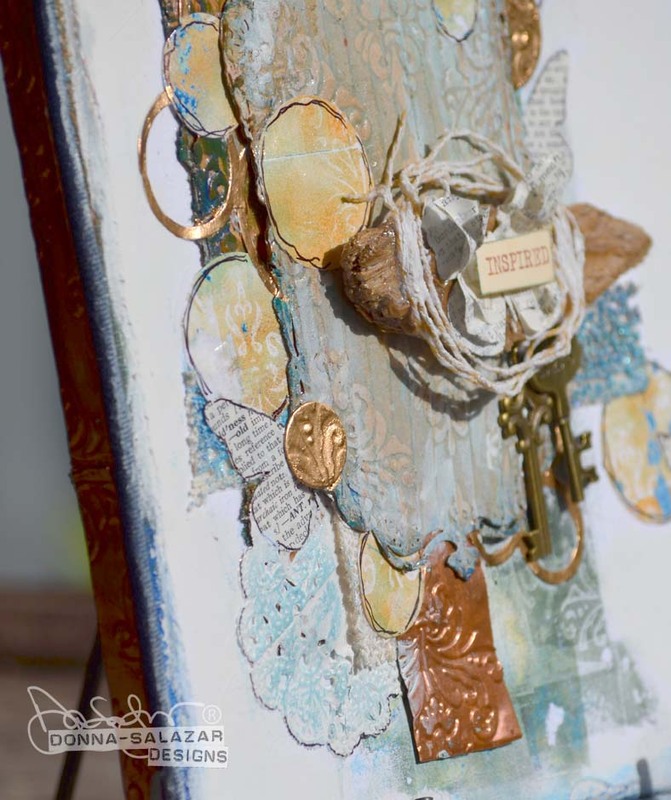 She spends most of her days watching her grandson and when she can sneak in some studio time, she can be found creating some “Girlie Grunge” projects. She has 2 books in the works and according to Donna, she’s living her dream! This is wonderful!!! And so many great tips along the way. Thank you!! !